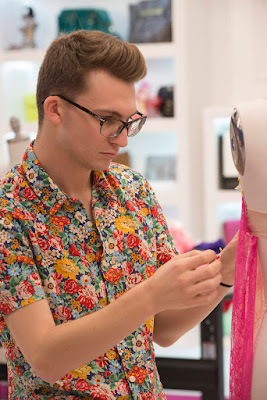 Project Runway Season 14 designer, Blake Patterson talks about his experience on the show. BPR: I have a reader question from Mark: "Why didn't you choose Ashley in the team challenge?" Why didn't ANYONE choose Ashley? BP: What was going through my mind was the previous challenge where Swapnil was up on the runway with me at the end. He really encouraged me to continue with my idea for the Mary Kay challenge. I mean of course I wanted Ashley on my team! I thought everyone would pick her! I was surprised at the end when Merline was chosen over Ashley. I was completely dumbfounded.